Garrett's Birth Story Mama Say What?! | Mama Say What?! 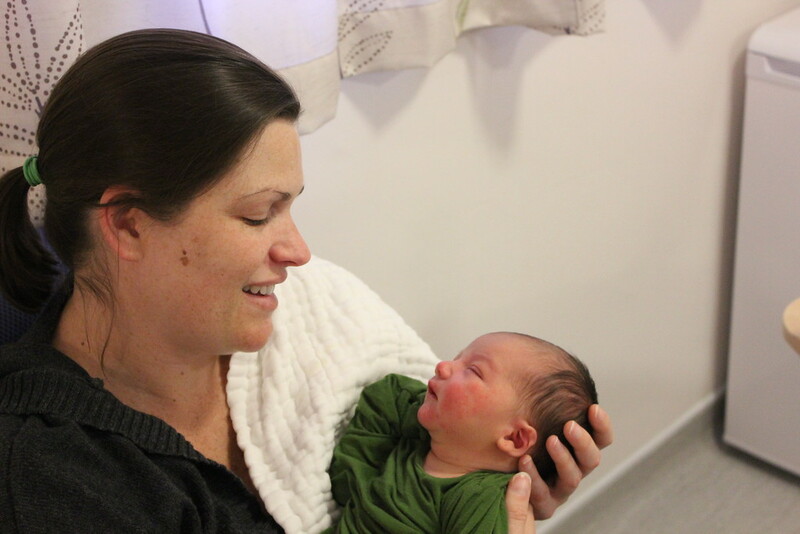 We found out I was pregnant just six weeks after moving to a foreign country, so needless to say, I was feeling very overwhelmed. Luckily, the National Health Service in England was fantastic and I felt like I had an easy pregnancy and as close to a perfect birth as you can get. 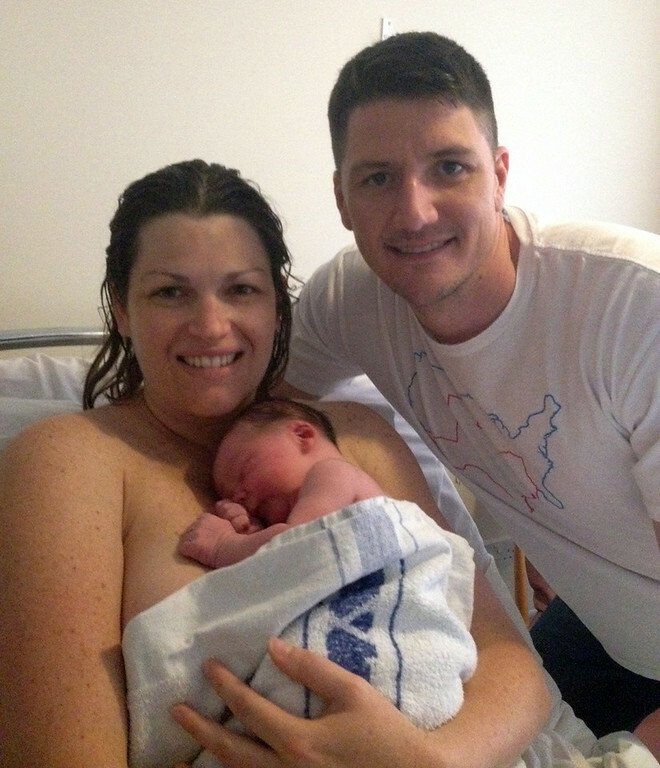 I was very happy to be seen almost exclusively by midwives during my pregnancy. 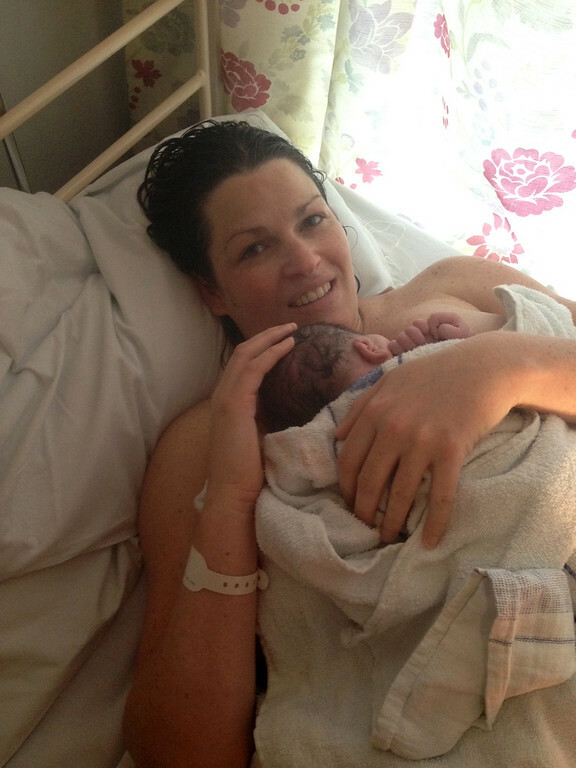 My midwife was very involved in how I was doing and feeling. I never felt too embarrassed to ask a question. I would see her every month until the last few weeks when it turned into weekly visits. Unfortunately, my blood pressure started getting high, so the last couple weeks before my due date I had to go to the hospital to be monitored and they scheduled an induction appointment on my due date. Thankfully, our son decided to make his appearance before the induction became necessary. I had been practicing some Hypnobirthing techniques with a friend of mine who was studying hypnotherapy. I highly recommend it. Throughout my pregnancy, I had absolutely no fears about giving birth and felt excited about it. I felt in control of my mind and my body and I learned how to truly relax. About a month before I was due, the midwife said she suspected he was in a back-to-back position (also known as sunny side up) so we focused on turning him during the next few therapy sessions and sure enough, during labor he had turned! The next morning, I fell asleep on the sofa and woke up an hour and a half later to no more contractions. I was bummed! I felt like all that ‘work’ was for nothing! Well, I spent all Monday resting and at 11:30 that night, the contractions started up again. I had no concept of time, but I know that for a while (maybe an hour and half) I tried to keep quiet so my husband could rest in case the contractions went away again since my husband would need to go to work the next day. As we got in the car, we realized that construction workers had left a truck in the driveway (a house was being built behind us) so my husband had to make a thousand point turn to get us out of the driveway. We probably left some paint on the wall but it’s a great bit to the story! The car ride to the hospital was excruciating. It took about 35 minutes on a bumpy, winding road. I kept asking him to slow down and he finally said “I can’t, we need to get you to the hospital and I’m only going 25 mph!” Oops! When we arrived at the hospital we immediately asked for the birthing pool and fortunately it was available. However, the midwife on duty didn’t want to put me in yet because she was afraid it would slow my contractions down since I had had false labor the night before. When she first checked my dilation, I was only 4 cm. But she allowed me to get into the tub in the hospital room and brought me Gas and Air (Entonox gas, which is like laughing gas). So each time there was a contraction, I would breathe in and it kind of took my mind off the pain. I liked it because it gave me a bit of courage about the approaching contraction. After an hour or so, I told my husband I needed more pain management (in England you can get a shot of pain killers) but looking back now, it turned out I was in transition, so it was the peak of the pain! Luckily he told the midwife (a new one had just started her shift) to get me into the birthing pool and they made it happen right away. I couldn’t believe how much the water helped the pain. After an hour in the pool they checked me and I had dilated quite quickly and the midwife was surprised and excited. I was just focusing on my job. I think I only said eight words the entire time. A bit later they asked me to get out of the water so they could check the baby’s heart rate and to see if I could start pushing again. Luckily his heart rate had only fallen because they had checked it while I was in the middle of the contraction. She asked me to give a urine sample while I was up and so I was sitting on the toilet when another contraction hit and the urge to push was so strong that for a moment I thought I was going to have my baby right there in the toilet. The midwife popped her head in and said “are you pushing” and I said “I can’t help it!” and she said “well let’s get you in the water and have a baby”. Once I started pushing I stopped using the Gas and Air so I was clear-headed. I was pushing on my back for a while and could feel his head with my fingers, but after about 35 minutes I felt like I needed a change to make something happen. I rolled over and was hanging on to the edge of the pool. It wasn’t much longer before his head came out. Everyone (two midwives and my husband) were behind me at the time and no one said anything, so I said “is he okay?” and the midwife said “oh, is his head out?” I would have said “yeah, that’s why I was screaming my head off a moment ago” but another contraction had started. They had me stand up in the pool with one leg up on a step (think of the Captain Morgan pose) so the midwives could help his shoulders come out, and whoosh, out he came with a whole lot of other stuff. They were a bit worried about the quantity of blood so they asked if they could give him to Dad first while they clamped the cord and took care of me. I wondered if I would have had the strength to hold him at that moment. I said “Yes, Morgan take your shirt off so he gets skin-to-skin!” We had asked for delayed clamping but they said they didn’t want to wait because they needed to find out where the blood was coming from. We thought that was fine and the cord had already stopped pulsing by that point. 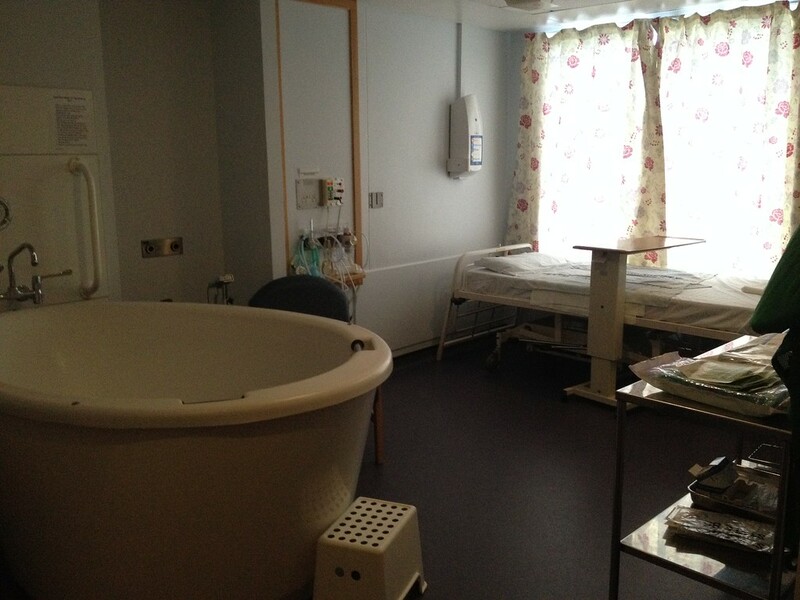 The midwives helped me to a bed so they could help me deliver the placenta. I was surprised at how painful that was since they did a bit of tugging to help it out. Luckily, the placenta was completely intact and there was no cause for concern regarding the bleeding; although they did give me a shot to help contract my uterus and slow the bleeding. I can’t even remember how long it was before I held Garrett. And honestly, that was okay. I was in so much awe of what my body had just done and I was quite happy to see his little body in my husband’s arms as I came to terms with the fact that we had just created a human life! Of course it was probably only a few minutes before I did hold him. I just stared at him endlessly. My legs were shaking like crazy from the adrenaline but I hardly noticed. I’m realizing now how funny it is that I remember certain moments so clearly and yet the order of things seem to be completely confused in my head. I look back at our birth story with so much love and amazement and awe. In the end, Garrett was born five hours after my water broke and eight hours after my contractions began. So with our next child, I’d better get to the hospital quickly! Baby L’s Natural Birth: It’s a Boy! Added by Guest Mama on May 17, 2015. What an interesting and beautiful story. This is wonderful!